SCHOOL TEACHER, to BLOGGER, to DESIGNER. First, there’s Paloma Contreras, an amazing interior designer in Texas who runs La Dolce Vita blog & just wrote beautiful new book, Dream Design Live. ﻿It was a vacation to Europe with her husband that awakened her interest in gracious living and a need to explore that more. Lucky for us readers/followers of Paloma & LDV she kept going! 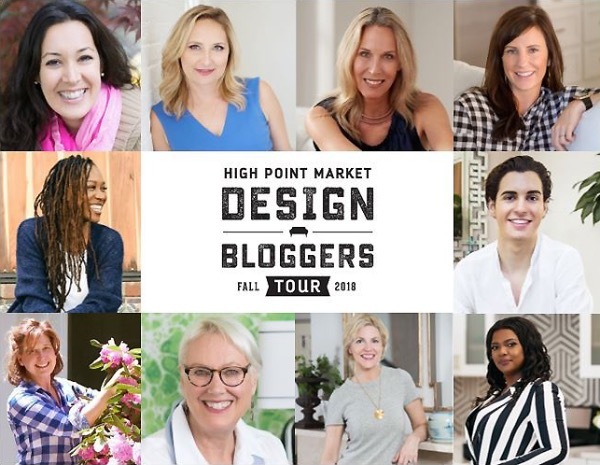 THE DESIGN BLOGGERS TOUR TEAM — This incredibly motivated group came from all over the U.S. to cover the Fall High Point Market with Esteem Media (& me!) & proved to me again that there is no shortage of talent & energy out there! Some of these bloggers are juggling huge design staffs & multi-million $ projects while raising their kids (I’m looking at you, Lori Dennis & Sara Chiarilli! ), and yes, blogging on the side. Others run staging businesses + design work + help create custom content for major national brands — hello, Cecilia Cannon! Meanwhile, Linda Holt is a serious photographer, Kevin O’Gara of Thou Swell is a full-time student at Cornell, & Nora Murphy does more than I can even keep track of - she just authored a wonderful book, Nora Murphy’s Country House Style, runs an online shop called Hunt Club, collabs with brands & media…. Nora & me at the Esteem Media/High Point Market book signing - very fun morning! Yes, they are busy but they are also FUN and passionate about their work — which comes through in all their final product. I loved meeting the whole gang - including Shavonda Gardner (who was juggling the One Room Challenge project while we were traveling & pulled off beautiful results! ), Allison Fannin & Veronica Solomon. It was a thrill to be with you guys & I learned so much from each of you! Last but not least, I guess this subject is on my mind because of the panel I got to be part of for the N. Virginia Chamber of Commerce called “How Smart Women Pivot.” It featured my friend, the amazingly talented Pauline Garris Brown, who knows a thing or two about pivoting (from her first career in finance, to branding as Chairman of Louis Vuitton Moet Hennessy/N. America, to teaching a course at Harvard Business School on the business of aesthetics & now writing a book on it for Harper Collins!). But if you are lucky enough to meet Pauline, she’s not going to tell you all this — she’s going to want to get to know YOU & what you are passionate about! (As she did when she came to my house after the conference & graciously looked past my “just moving in” piles - it’s been a year! :( - to ask me about my antiques & such!) The most successful people I know are the ones who are not concerned with sharing all their bona fides or how BUSY they are…When we’re in the right role, we have so much more positive energy & that’s a gift to everyone around us. So sorry for the soapbox today, folks, but I hope you can draw some inspiration from these amazing women (+ Kevin:), who are renegotiating their roles every day to find most interesting place to put their energies. Because we only go around once, right!? ?